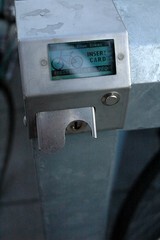 While up in Vancouver (WA) recently, I got a tour of the Northwest’s first pre-paid bike lockers. City of Vancouver transportation planner and BikeStation board member Todd Boulanger worked for over a year on the project and was excited to show them off. The lockers work on a debit card system and cost just five cents an hour. For an average commuter that would be about $20 for six months of parking. The pods themselves fit two bikes each and are built with see-through, metal mesh sides and a futuristic looking, blue bubble top They were paid for through state and federal grants totalling over $16,000. There are currently ten of these lockers throughout downtown Vancouver and TriMet has plans to bring these to their Hollywood Transit Center when it is renovated this Fall. 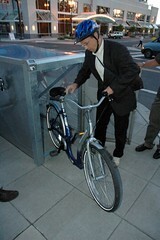 The lockers are built and managed by BikeLink, a Berkeley, California-based company with similar lockers in place throughout Northern California. 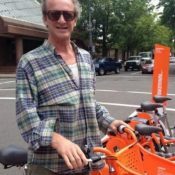 Kudos to Todd for being such an urban cycling evangelist. 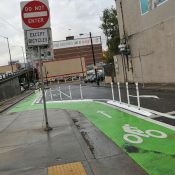 These covered, reliable and secure “end-of-trip” facilities remove yet another barrier for would-be cyclists and encourage more people to ride instead of drive. Those crazy Canadians! Did you take the train all the way up there? That is so cool! We could really use some of those here in PDX! this may be a stupid question, but what is stopping people from dominating the use of these lockers……like leaving their bike there for a week or something? Man, I would feel a lot better about bike parking downtown or in the neighborhood commercial areas if there were some of these around. They look a lot more secure than any lock and the pricing seems very reasonable. How much do they charge for one of these things? Wow, that’s cheaper than my apartment, and nicer, too! 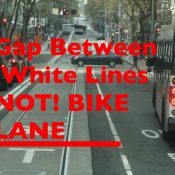 We should have 4 bikelink spaces installed at TriMet later this summer/fall. They look like great places to take a nap after too much drinking! Any of these going in old town? The 10 lockers are at two locations in Vancouver’s City Center with high demand for bike parking (and theft issues): Courthouse and Vancouvercenter. Both are Flexcar sites too. We have about 60 bike lockers total in this district. The pricing aspect is for purposes of demonstrating that lockers can be shared (used but not abused by one parker) vs. a profit. So 5 cents an hour with 2 hours free. The lockers could be set for rates between free and 99 cents an hour (per my memory). There is a mechanism to set a higher late fee (2x or 3x hourly rate), so that parkers do not leave their bike there forever (turnover). Public comments on what rates for parking at these demonstration lockers are being gathered on this on-line bike survey…over 180 of you have replied already. It is still open for comment. Ideally, in the future, it would be more successful if some private company(ies): Obie Media, Diamond Parking, etc. or a large public grant were to provide a fleet of these locker pods throughout the city…vs. a few small sets…here and there as annual government budgets allow. Or perhaps Flexcar could have one at each car share pod, so one could bike to a Flexcar and leave their bike safely there while they rent a car. These lockers can also vend bicycles too. More to follow…as usage continues. Our recent coverage of the BikeLink program in the Vancouver section of the Oregonian has netted us more demonstration users of the ‘paid’ electronic bike lockers in Vancouver. 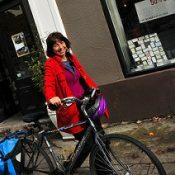 There have been 20 requests for the 15 BikeLink.org cards so far. Let me know by 6 July.